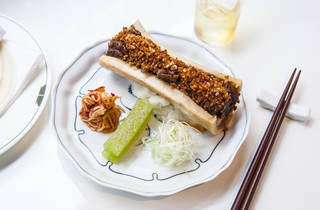 A smart Taiwanese restaurant from the crew behind Bao, with a vintage feel. You know what’s better than new? Old. Not ‘old old’, like when your housemate leaves a packet of chicken at the back of the fridge and goes on holiday, but the good kind, that evokes the best of a bygone era. Vintage. That’s the vibe at Xu. (Which, btw, is pronounced ‘Shu’. Not ‘Joo’. Not ‘Sue’.) 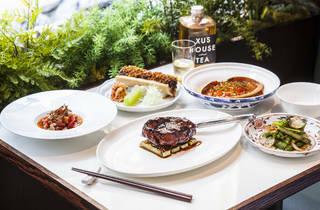 The first ‘smart’ restaurant from the crew behind cult hit Bao, it’s a love letter to 1930s Taipei. It’s got class, but no hanger-up-its-bum. Our waiter was in black tie, yet effortlessly switched from ‘chummy and attentive’ toward those of us obvious Bao groupies, to ‘polite and obliging’ for the ostentatiously wealthy family that arrived, took umbrage with their table and demanded to be instantly rehomed. True, it’s not a perfect site. 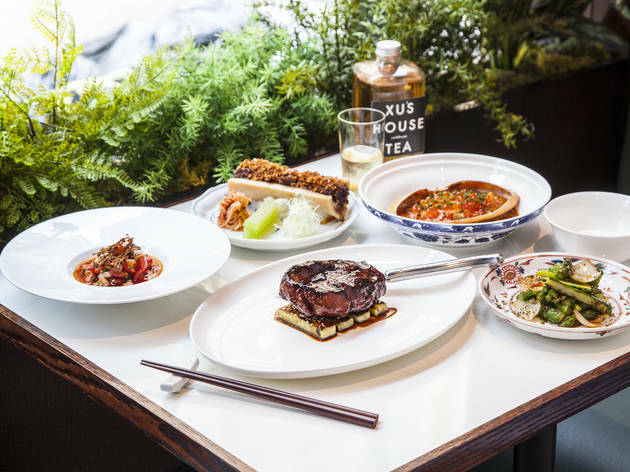 It’s one of those narrow, awkward Soho spaces, but the Xu crew have been fairly clever about it, carving up the two small floors into a bundle of mini-spots, each with its own air of intimacy. There’s dark wood panelling, crisp air con and ceiling fans idling overhead. 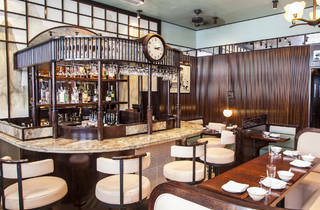 The upstairs room has a teeny bar at its centre, offering a few more seats and a railway clock. It’s the louder of the two floors, with lively chatter and Dean Martin singing ‘Papa Loves Mambo’ (anachronistic but fun). 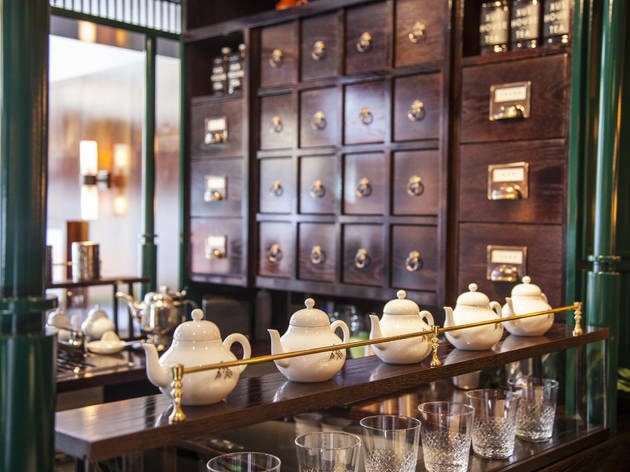 At street level, there’s another central bar – more of a hatch, really – with someone polishing not glasses, but porcelain tea cups. Tea is big at Xu. But you didn’t come for the tea (though it’s very good). You came for the food. And oh my. It’s magnificent. There’s a devotion to subtle nuances in texture, layered with the full spectrum of sweet, sour and spice. 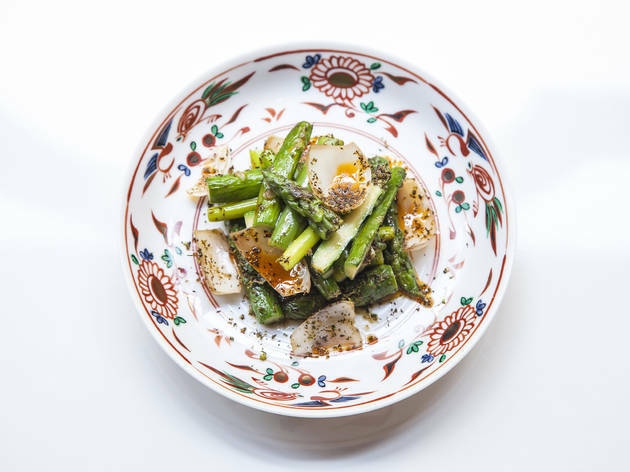 Everything I ate was terrific – from a bowl of plump rice with chewy fried onions, to grilled asparagus with the crunch of lily bulbs, to a juicy, sweet, smoky slab of char sui Ibérico pork. 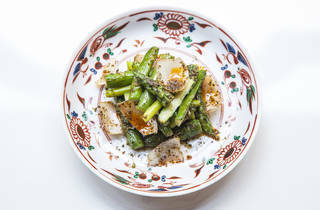 But there are three dishes that have earned podium places. First up, beef with pancake: not unlike duck with pancake, only with a filling of tender shortrib. 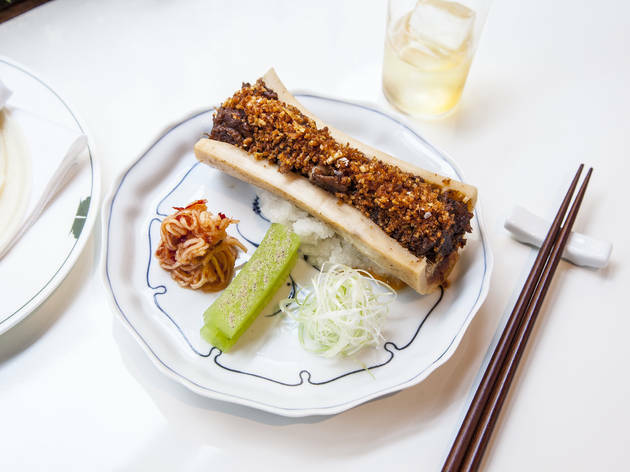 It had been enriched with bone marrow and came served in the hollowed-out canoe of a calf shin. With a potato ‘crumb’ on top. Because who doesn’t love a cheeky gratin? It’s this kind of attention to detail – without getting silly about it – that points to the kitchen’s skill. Or the tomato and smoked eel: a stunning cold soup-of-sorts, oscillating between sweet and salty, smoky and tangy, with notes of heat, the delicate texture of Lillipution cubed eel and the fragrant soapiness of coriander stalks. And, oh yes, the chilli egg drop crab. 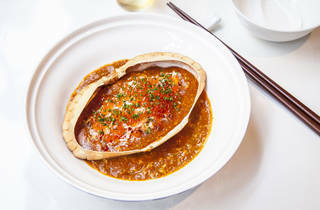 A creamy curry, full of crabby flavour, with the odd blob of wibbly, jellyish egg (that’s the ‘drop’ part), served in an upturned crab shell. It’s got a punchy heat (that’s the ‘chilli’ part), but plenty of depth. Not to mention delicious, delicately briny accents, when the salmon roe pops on your tongue. Best of all, despite its upmarket schtick, Xu is not stupidly expensive. I mean, you’ll pay more than you ever would at Bao, but that’s missing the point: this is not meant to be a street food joint. Given the quality, it’s still excellent value (tip: order lots of that lovely onion rice to make your meal go further). Xu: I think I love you. So I'm going to put it out there, Xu is the best new opening of 2017 and the best place I've eaten all year. I saw the 5 star review and timeout magazine and I had to visit immediately. I tried to book online for the following day and there were no tables for a suitable dining time so we risked it and went after work. Luckily we managed to get a table after being told that they were fully booked for the evening with limited space for walk-ins. The decor reminded me of an old speakeasy kinda bar but with lots of light! We were seated and our bags were put in push out drawer under the seats. I love this as it's always so frustrating for a girl going to a restaurant and there isn't anywhere for you to put your bag. It's quite cramped but the individual table booths give you enough privacy. The fusion Taiwanese restaurant is from the same owners as Bao so I was ready for a delicious feast and they didn't fail. I order the Taro sweet potato dumplings which were so good and had the most interesting of flavours. I then had the char siu pork which was amazing!!! My friend opted for the pre-theatre menu, on which she ordered the asparagus and the seabass for mains. The main came with a side broccoli and rice. It was all yummy and the pre-theatre menu was good value for money. Overall the restaurnt is more expensive than a meal at Bao but so worth ìt. They're also a tea house - I'd recommend the cold sparkling tea which went well with all dishes and was also great on it's own. The service was good, they're as engaging as you want them to be and are attentive. The only downside was that we had a slightly long wait between our starters and mains and we were slightly late for our show but we didn't tell them so I suppose it was also our fault. I'm definitely going back soon. So impressed with the food! It's an interesting take on Taiwanese/Chinese food but with such a great twist. My friend and I both went for the Express Lunch menu. This was a 2 course meal with a starter and a main. For my starter, I went for the Cuttlefish Toast. A fancier version of the traditional 'prawn toast' and so delicious. The toast was golden and so crispy, it's incredible. It had great flavour and a good start to the meal. For my main, I had the Ma Po Tofu. This is served with a steaming bowl of rice, which was cooked perfectly! I loved my tofu, as it came with firm tofu on the bottom and homemade silken tofu on top. The sauce and spice levels were perfect and to my liking! My friend went for the Iberico Char Siew as his main and it was simply the most delicious char siew I've eaten in London! It was such a generous portion as well, a sweet and caramelised top and quality pork! I would definitely come back for this again as I was so pleased with it. Both main dishes felt very home-y to me, such a satisfying lunch! To go along with our meal, we both had a G&T, which was also really delightful. It smelled like grapefruit, was served with a slice of grapefruit rind and subtle in taste - a great accompaniment. My friend and I were really pleased with our food and intrigued by the chef's influences. After asking a waiter, he was very kind to explain that the head chef comes from Canada but has lived in Sweden the last few years. She even came out to say hello to us, which was so sweet of her! We had a great chat and we couldn't stop complimenting her and her kitchen on the food. Really a great experience, I'll be back again for sure! Had one of the most unfulfilling lunches in my life for a fortune. This is a place for fashionistas and hipsters, not food lovers. We came here on a Friday night without a reservation and was able to get a seat immediately. 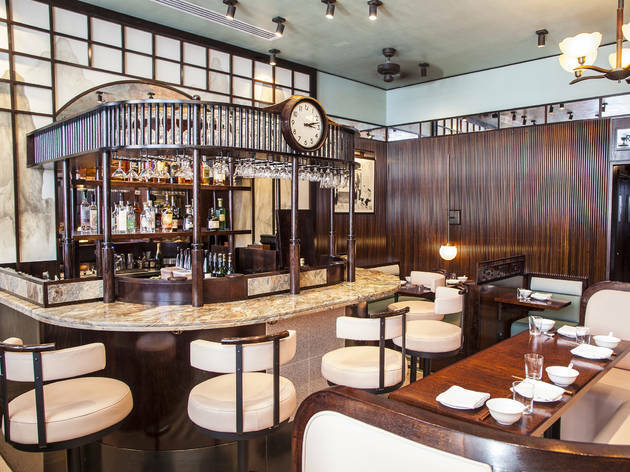 This was a place we wanted to try after one of their dishes were ranked #1 on Timeout's best dishes of London. 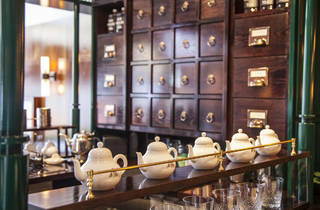 The decor is a modern twist to a traditional tea house, really cute. Everything we ordered were executed to perfection, we couldn't believe how delicious everything was. All hits and no misses. We got a lovely pu-er tea too and learnt how to steep is properly. Dishes wise, we love the eel/smoked tomato and the chicken in white soy. Will be back to try the rest of the menu. A love affair with BAO put Xu at the top on my hit list for 2017. I went with high expectations for this vintage Taiwanese soho-eatery but emerged distinctively underwhelmed. The dishes are unbearably spicy, small portions and way over priced. You pay over double than you would for a meal in BAO, for arguably half the satisfaction. The beef bone marrow pancakes and chilli crab were the only winners for me, but maybe we ordered wrong. This (on 19 Oct'17) a rainy thursday evening was our second visit to Xu to celebrate my friend's purchase of her first home, and Diwali the Hindu new year. We went drawn by the excellent buttered champagne cocktail and good food from our first visit. It was all about the attitude shown by the management. My friend made a mistake and instead of booking a table for 2, she booked a table for 1. We showed up and were happy to wait for a table (for 2). We waited for 2 hours and 30 minutes from 6.15pm to 8.45pm. WE told them the occasion and how much we'd appreciate a table to celebrate. In 12 years living in London i have never been turned away from a restaurant (even if i had no bookings). So I wasn't impressed that Xu could not find us a table . What was worse was that the meaning of the words hospitality and celebration meant nothing to them. They almost ruined our evening. We went to a chinese place nearby in Chinatown on doorstep of Xu normally known for it's "robust" service and were welcomed warmly, served piping hot food and given lollipops to celebrate diwali. Next time I have 200 quid to spend on a night out i will not think of Xu. I really wanted to like Xu. I went in completely wow-ed by the old school Chinese decor and continued to be impressed with their gin and white miso cocktail and bottle of cold-brewed tea. The menu is completely intriguing and we were more than happy to order all the six staters and two mains the waitress suggested. But what a let down - the food is rather average and portions are tiny! The pickled clams, smoked eel, taro dumplings and numbing beef tendons were rather mediocre. The only starter that stood out was the steamed truffled egg. The chicken main was enjoyable but rather salty, and the iberico char siu was tough and not worth the price. The fried rice was completely ordinary, as was the kale with taiwanese sausage. All in all, a rather disappointing experience. After visiting BAO and being an absolute super fan I decided to give XU a go. On the off chance they had a free slot mid week, we decided to pop in for pre theatre dinner, and I am so very glad I did. Although based in the busy area of Chinatown, XU as soon as you enter through the front door is like the very clam and collected older brother of BAO. Small tables, wonderful décor and amazing food! Taiwanese is more than just Baos and this is exactly (in my opinion) the place London food scene requires. 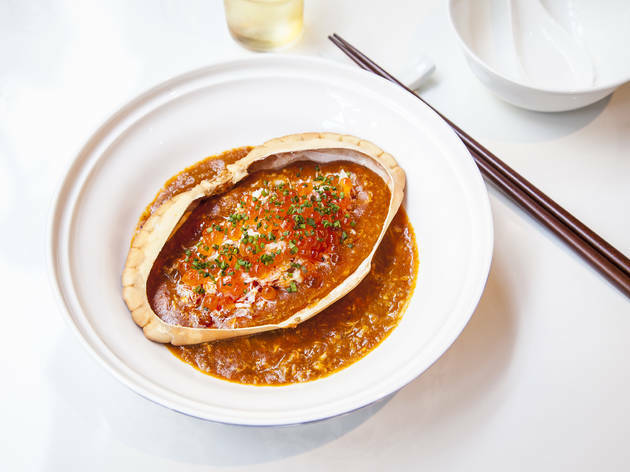 Menu is a mixture of small plates consisting of classics, mains, rice, vegetable options with a broader take on Taiwanese dishes such as the Chilli Egg Drop Crab, Seabass etc. Beautifully presented food. Highly recommended and I plan on returning very soon and sampling all the other items I missed out on including more of the teas too. I had booked when they first opened, not knowing anything about it except it was from the owners of Bao (thus must be good right?). On the day I looked at the menu and was a little apprehensive and almost cancelled. I'm so glad I didn't! The flavours are amazing! We had the beef pancake which was so flavourful we were fighting after who got the last one. Then shared the signature chicken dish and the beef. My favourite was the beef, dipping it in the gooey runny yolk and the sauce but my companions loved the chicken, rating it the best in london!! High recommend!